Britain’s longest-running and best-selling guide contains Britain’s best pubs for real ale. The Branch pubs from our area in this year’s Guide have been recommended by dedicated volunteer members of this branch. The Good Beer Guide is completely independent. There are no entry fees for listings, and every pub is checked many times a year by discerning local CAMRA members. 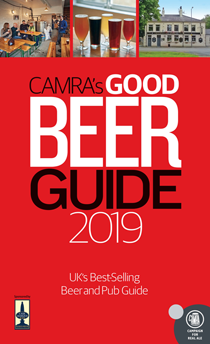 The 46th edition of the guide lists more than 4,500 pubs and also contains full information on over 1000 breweries & brewing companies operating in the UK. Follow this link to purchase a copy of the guide from the CAMRA Online Shop. To compliment the Good Beer Guide, CAMRA has developed WhatPub.com. This is a searchable web based pub database (compatible with mobile phones) covering the whole of the UK where you can view pub details and submit comments, errors and corrections. WhatPub currently contains over 35,788 pubs in total serving real ale, over 34,007 pubs of which have full details.